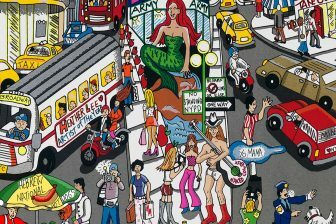 Charles Fazzino is the biggest name in pop art today, with galleries and exhibitions across the globe, in more than twenty different countries. He’s committed to rewarding his fans, so we are running a Facebook promotion that does just that! This is your chance to win the “Ghosts, Good Times & Gridlock” thousand-piece puzzle, just in time for Halloween. 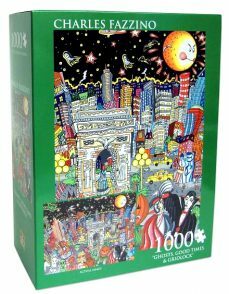 Featuring exciting original artwork by the one and only 3D pop art maestro himself, this jigsaw puzzle hosts ghouls, ghosts, and other costumed characters. 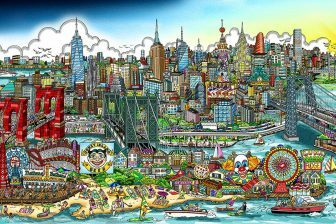 Fazzino’s artwork brings to life the season, the holiday, and the city of New York in this 27 inch by 20 inch puzzle. Over the next twenty eight days, between now and Halloween, we’re trying to get our Facebook Fazzino Fan page up to 5,000 fans. Spread the word, because if we get there by the 31st of October, one lucky fan will be randomly selected to win the puzzle! 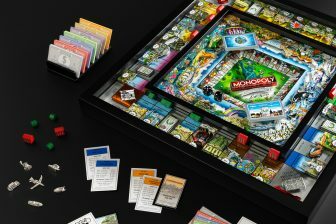 Even if you don’t win, you can order the puzzle through Barnes & Noble. Charles Fazzino’s iconic, distinctive 3d art style is all over the place, and unforgettable. Become a fan of Fazzino on Facebook!